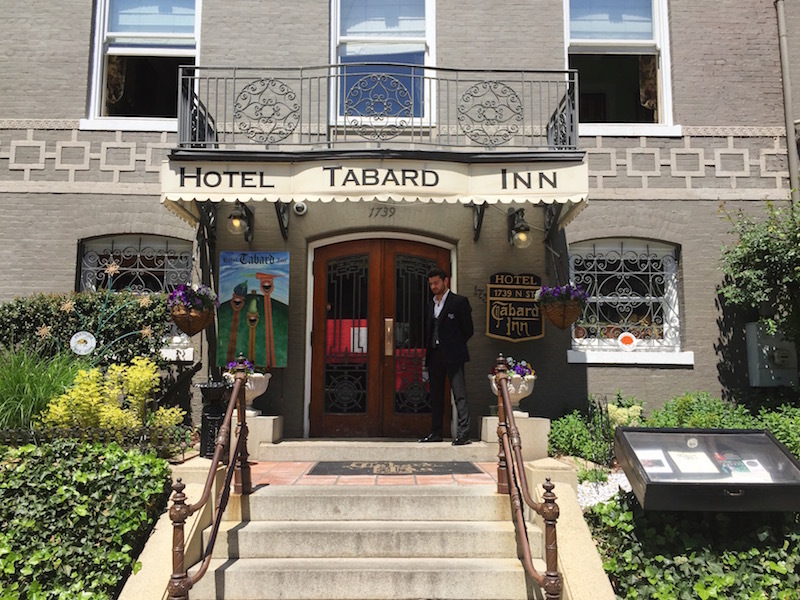 If you are a Washingtonian, you are likely aware that Tabard Inn’s brunch has become a staple of Washington, DC, long holding the coveted spot as the city’s best brunch. 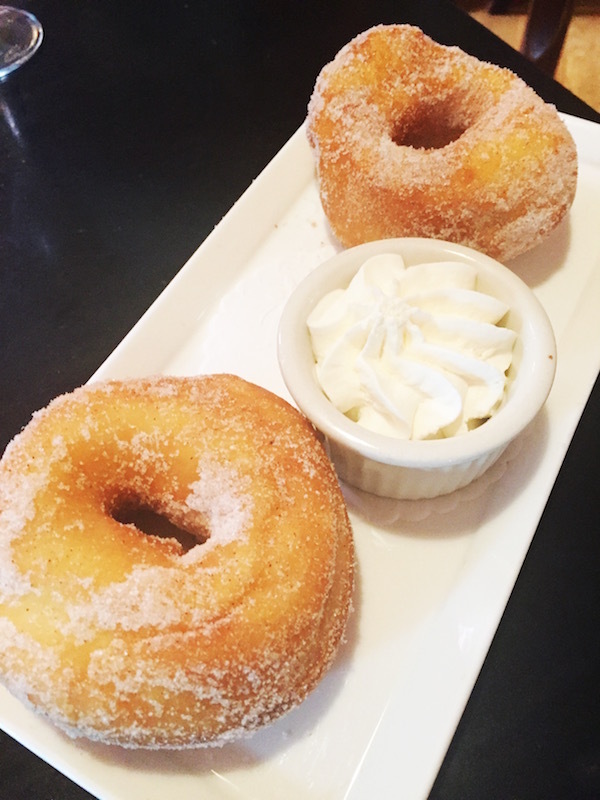 So naturally I had to make it the subject of my first DC brunch post. I am a bit ashamed to admit however, that I only recently tried their brunch menu. 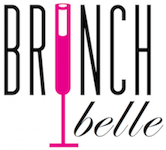 I know what you are thinking… how can I call myself the Brunch Belle right? 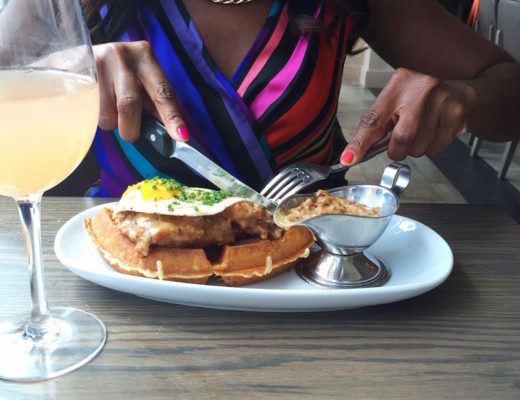 But hold up; don’t take away my Brunch Belle card just yet. The reality is that the Tabard Inn’s popularity makes it extremely difficult to get a table without having a reservation. 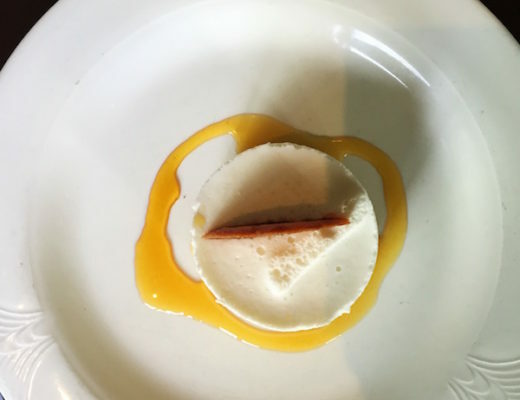 I’ve dined at Tabard Inn before and the food left such a lasting impression on me, that I made a mental note to visit during brunch. However, every time I’ve attempted to do so I’ve had no luck getting a reservation. This time I decided that I had to make it a priority and scheduled a brunch date a month in advance with my friend Paula. The restaurant is located inside the historic Hotel Tabard Inn. I should start by saying that the Tabard Inn is the cutest, quaintest, place ever! Its charm is undeniable. 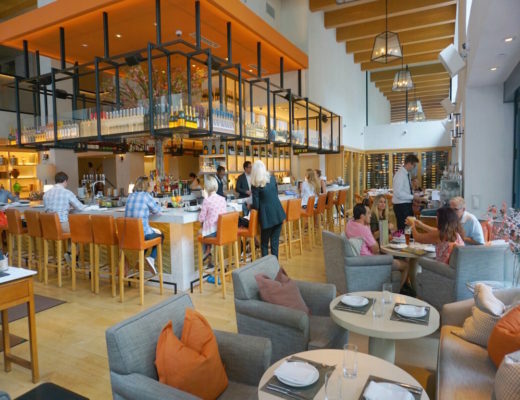 The dining area is much larger than it may appear from the outside, consisting of several different rooms, including an outdoor courtyard style patio. The patio’s brick walls are adorned with cascading vines and make the perfect backdrop for a fabulous bellini-sipping outdoor brunch. As soon as I spotted it on the walk in, I regretted not requesting outdoor seating when I made the reservation. I inquired about the possibility of changing tables (hey, a Belle can try), but who was I kidding! Brunch started with a complimentary basket of mini coconut and carrot muffins. They both were rather tasty. Paula isn’t too fond of coconut (she definitely needs her island girl card revoked) but she commented on how “yummy” the coconut muffin was. Shortly after, our drinks arrived. I had the bellini, Paula had the poinsettia (cranberry juice and sparkling wine), but we sampled both. That resulted in a debate about bellinis versus poinsettias. I prefer the taste of peach to cranberry so I was hands down team bellini! In the midst of this discussion the host appeared with a plate of doughnuts explaining that they were “on the house” since the restaurant was unable to sit us outside. Now if that isn’t great customer service, I don’t know what is! I never requested the patio in advance; neither did I feel entitled to have my on-the-spot request granted. Needless to say, that kind gesture scored extra points with me. It also helped that the doughnuts were quite possibly the best free food I’ve ever had. They were like manor from heaven: little sugary delights. After placing our food order, Paula and I got to talking. We were twenty minutes deep in conversation when my stomach alerted me that we still had not received our food. Our order took about thirty minutes to reach our table! Let me just say that I am a “talker.” I am one of those leisurely, all-day-affair brunch types, who’s never in a rush, and is always among the last group of people to leave the restaurant long after brunch hours have ended. But even for me, thirty minutes is a long wait for a party of two. I am not sure if this is a typical occurrence during brunch or was just an off day. When the food finally came, we attacked it like vultures. As Paula bit into the savory tart she mumbled, “this is good; this is really good!” A thought I believe she said in her head without realizing that it manifested out loudly. It’s the kind of reaction you give when food exceeds your expectations. I took a bite… or two, and I would have to agree. It was “really good!” Such an explosion of flavor in the mouth; no wonder her immediate reaction. 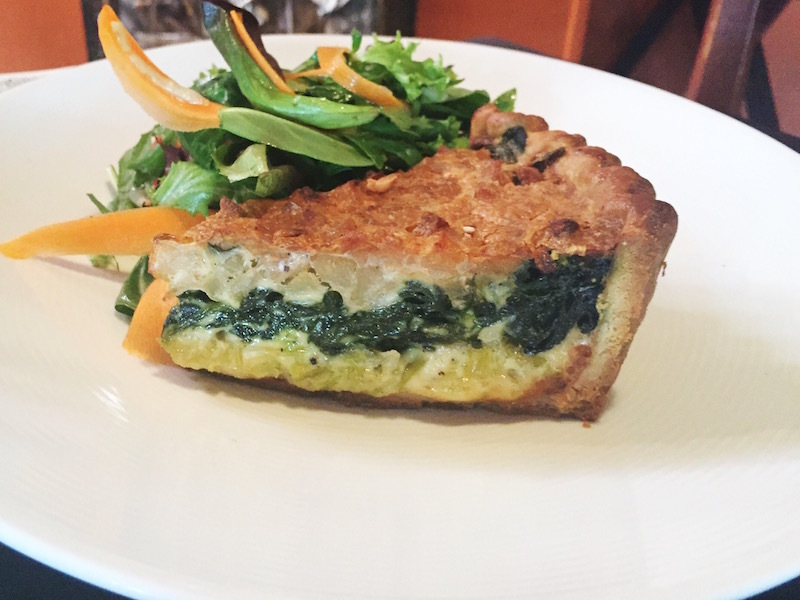 The savory tart essentially mimicked a quiche and was a creamy mix of potato, spinach and cheese goodness. It was served with a light salad, and was my favorite dish of the day. The crab lover in me was happy to see the Chesapeake benedict on the menu, and I decided to go for it. It was your basic benedict dish. It did not wow me, but it did satisfy my crab craving needs. 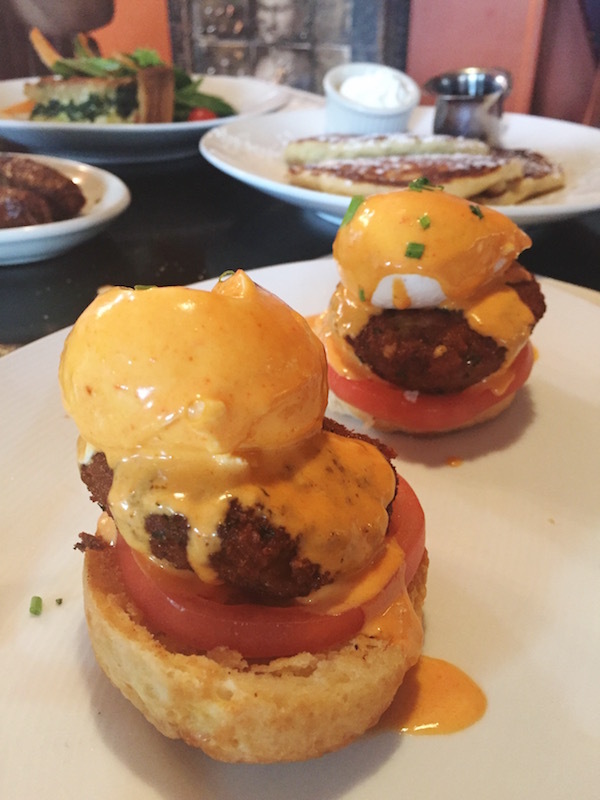 The dish consisted of two house made biscuits and jumbo-lump crab cakes, topped with poached eggs, tomatoes and a roasted red pepper tarragon béarnaise sauce. We also ordered and shared the vanilla pancakes. Paula commented that they were the best pancakes she’d had in a while. I can’t say that they are the best pancakes I’ve had, but they were pretty amazing. They are definitely high up there on my list of great pancakes. I absolutely enjoyed them. The texture couldn’t be more perfect: light and fluffy, just the way I like them. The Tabard Inn gets an A-. 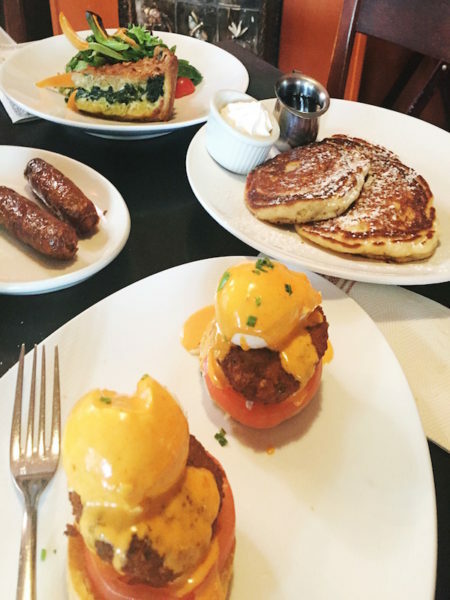 The food was delicious, the setting was charming, and were it not for the wait I would have given Tabard Inn a solid A. I wouldn’t call it the best brunch in DC, but it lives up to the buzz it’s created around town, and is certainly Brunch Belle Approved. 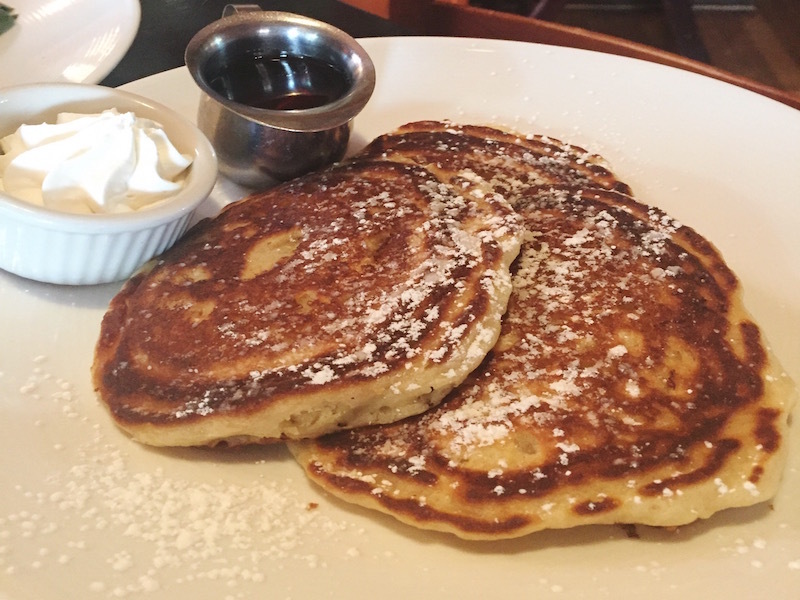 If you live in the District and have not yet been, or you’re planning a DC visit, you should put Tabard Inn on your places-to-brunch list. It is the kind of brunch that you will have to plan ahead though. I recommend making a reservation at least two weeks in advance. The patio is a must if you are dining during warm months. The hotel offers valet parking for $10. Find their brunch menu here. The Tabard Inn serves brunch on Saturdays and Sundays from 10:30a.m. – 2:30p.m. Love this review! Is the Tabard Inn in the same category as Acadiana? I went to Acadiana after you recommended it. It was delicious! I trust your taste buds!!! !